We would not describe this face as ugly so it can't be Socrates. We reckon it's Homer - he's often shown with a beanie hat. 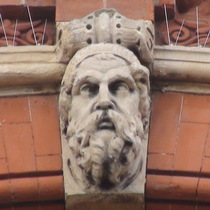 The busts are on the keystones of the library first floor window arches, numbered left to right. Ornamental Passions has posted about this building and also fails to identify number 5. The building was designed in 1890-2 by John Johnson and opened by John Lubbock. The library closed in 1989. Poor dear, we've seen her looking better.